Nigeria Navy needs a Coast Guard. For years the Western Indian Ocean was the hot bed for sea piracy. The Eastern coast of Somalia was said to be the most dangerous coast in all of Africa, and for decades the Somali’s revelled in their status as Kings of Dark Seas. Hollywood made movies like the 2013 movie Captain Philips, which became a blockbuster success. Dozens of movies were made based on incidents that have taken place in people’s lives. Gulf of Guinea in West Africa. There is no denying the fact that West Africa, and Nigeria in particular have the worlds most dangerous seas. This is gonna be a problem. The waters south of Nigeria’s oil producing Niger Delta is vital to the Nigerian economy and any disruption of oil production will have an adverse effect on Africa’s biggest economy. NNS Thunder F-9. Flagship of the Nigerian Navy. In 2008, fifty persent of Nigeria’s fishing vessels refused to go out to sea because of how dangerous such an endeavor has become in recent times. In January 2017 there were 50 attacks on merchant ships and 10 murders. numerous complaints was that when an attack occurred, there was nobody to call for help. Without some form naval escorts they were going no where. The Nigerian navy is overstretched. There are simple not enough vessels to patrol every water ways, oil terminals, anti piracy operations….,.the Nigerian navy lacks the capacity to run operations in such a scale. The solution to this might be to create a support service to reduce the burden on The Nigerian Navy, freeing up vital assets to area where its needed. The Nigerian navy —one of the most sophisticated navies in Africa, with a demonstrated capability to sail to Australia, Europe and South America is not designed to combat maritime armed robbery and piracy. It is essentially a blue water navy, one that was capable of shelling rebel forces in Sierra Leone in the 1990s but is powerless to deal with local crimes. Nigeria’s experience reflects Africa’s maritime security environment. Of the 33 independent maritime nations in sub-Saharan Africa, only five—Cape Verde, Liberia (when legislation is finalized), São Tome and Principe, the Republic of Mauritius, and the Republic of Seychelles have maritime forces that identify themselves as coast guards rather than navies. Yet Africa’s maritime security challenges are most often comprised of threats such as illegal fishing, narcotrafficking, and maritime disaster response, threats requiring the technical skills and collaborative…..with local crime. .
Navies and coast guards play fundamentally different, though complementary, roles. Navies are international operators primarily concerned with national defense. Coast guards, on the other hand, function more as maritime police, preventing crime and promoting public safety. Examples of the navy being used as an instrument of diplomacy and political/strategic posturing. In 1907 the then U.S President Theodore Roosevelt dispatched the “Great White Fleet” around the world in 1907 to demonstrate the re-emergence of the U.S. Navy as the new kid in the block. In 2009, the Russian Navy and China’s PLAN carried out joint naval exercises in the Gukf of Aden. 2011. At the height of the Ivory Coast’s post election crises the South African navy deployed a warship – SAS Drakensberg to the Gulf of Guinea. This symbolic action was not lost on the Nigerian government. In September 2013 the Nigerian Navy made history when for the first time it visited Australia for the annual Australian International Fleet Review, traveling more than 24,000 km from Lagos as Africa’s sole representative. At about 24,000 kilometres, this is the furthest any African navy had gone, cementing Nigeria’s position as one of Africa’s naval superpower. January 2017. 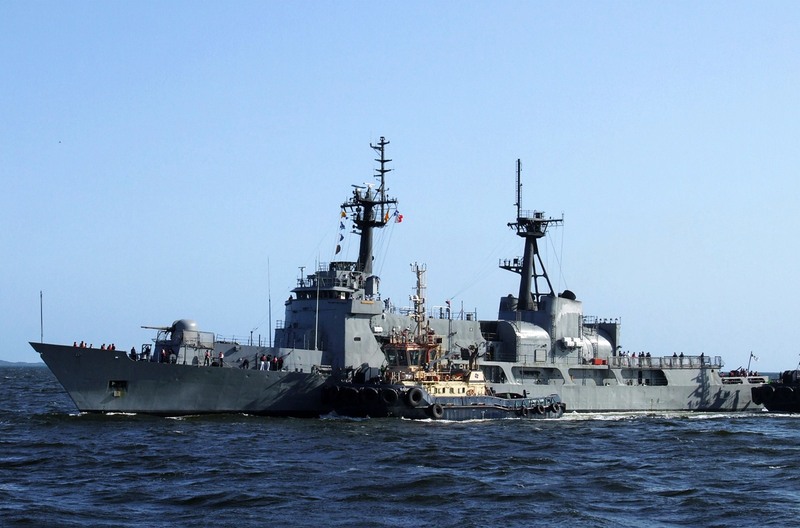 Nigeria deploys it’s newest warship NNS Unity to the Gambia in a show of force. The deployment was part of the strategy of ECOWAS to force out President Yahya Jammeh who refused entreaties from the region’s leaders to step down following his last December 1 presidential election defeat by Mr. Adama Barrow. There is no way the Nigerian Navy can can enforce laws combating legal traffic in weapons, narcotics, cigarettes, illegal fishing and other contraband that passes inside Nigeria’s EEZ, as well as support environmental protection efforts that prevents illegal fishing, dumping of waste and other toxic stuffs. There is just no way the Nigerian navy can effectively carry out these operations without compromising its blue water capability which entails protecting strategic assets such as offshore oil terminals hundreds of miles out into the Atlantic, responding to maritime disasters etc. The Nigerian Navy needs a Coast Guard service semi independent from the Navy, able to carry out independent operations. This coast guard fleet must be capable of performing search and rescue (SAR) activities and patrolling coastal waters, lakes, and rivers. Their vessels include cutters, tugs, buoy tenders, and icebreakers, as well as small boats for harbor patrols and interception activities close to shore. Coast guard fleets do not include vessels as big as the larger naval platforms, but their cutters and enforcement plat- forms are equivalent in size and capability to some naval surface combatants like frigates. As the biggest maritime power in black Africa Nigeria deserves a Navy in which we can be justifiably proud and which is worthy of this great country and that it would be inadequate for Nigeria to have “a token Navy which is capable of plying on our lagoon and River Ogun and no more. We need to totally dominate the West African maritime domain and use it as a tool to further our national interest. Ten months ago Nigeria spent $300 million to restore democracy in the Gambia. Hundreds of Nigerian Special Forces stayed behind to maintain peace after the successful resolution to the impass. Yet, Australia yesterday (November 21) just secured a 1.1 billion barrels of oil from Gambian blocks. How is this possible in our own backyard. It took the Nigerian Navy 60 days cruising at 40 knot to cross the Indian Ocean and get to Sydney. Thats 24,000 miles. How did the Aussies beat Africa’s biggest oil producer its very own backyard ? The Nigerian Navy cemented herself as Africa’s maritime power just by being the first ever and sole African representtive at the Austalian International Fleet Review in Australia, covering a staggering 24,000 kilometres. We can improve on this by upgrading our fleet, adding offensive and defensive armaments and perhaps participate in the world’s largest international maritime warfare exercise – RIMPAC. At the moment the Nigerian Navy is the sole African navy capable of navigating such huge distances. Next Post Naval Power : South Africa’s Valour Class Corvette and Nigeria’s Hamilton Class Frigate. Who Rules?